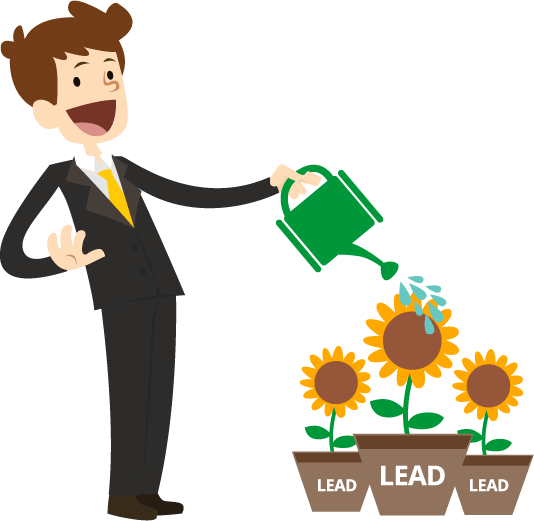 Want to learn how to nurture leads? In this article, we explain exactly what lead nurturing is, and why it’s necessary. On top of that, we also do a deep dive on 3 different lead nurturing tactics that you can apply to your own company. In a nutshell, lead nurturing is the process of developing relationships with potential buyers, and moving them down your sales funnel. With lead nurturing, you’re reaching out to your consumers via different touch points, and providing them with the information they need to move on to the next stage of the Buyer’s Journey. Before we talk about how to nurture leads, let’s also explore the importance of lead nurturing. On average, 50% of the leads in any system are not yet ready to make a purchase. If you simply sell to those who are ready to buy and ignore the rest of your leads, you’re reducing your potential revenue by half, right off the bat. On top of that, lead nurturing is a great strategy for companies who want to increase their sales without increasing their marketing budget. According to research from Forrester, companies that excel at lead nurturing generate 50% more sales at a 33% lower cost. Despite the many advantages of lead nurturing, a study by MarketingSherpa shows that only 36% of marketers actively nurture their sales leads. By working on your lead nurturing strategy, you can gain a leg up on your competition, and give your company an edge. Let’s move on to talk about how you can identify which leads to nurture. Which Leads Do You Nurture, And Which Don’t You Nurture? Now, in order to have your lead nurturing efforts be productive, you’ll only want to reach out to the third and fourth categories of leads. The first two categories will make a purchase anyway, so there’s no point nurturing them. And the last category won’t make a purchase, so again, don’t waste your time on them. Now, the question is: how do identify the third and fourth categories of leads? Easy. Develop a lead scoring strategy, and use this to rank your leads based on the revenue they’re likely to contribute to your company. First, come up with a lead scoring model that dictates what characteristics or actions result in what sort of scores. Next, assign a value to all the leads who enter your system based on this model. Finally, use these scores to determine whether you follow up with your leads. Now, the question is… how do you come up with a lead scoring model? What many companies do is use data from their past leads to create a value system. First, take a look at your existing customers, and see what they have in common. Predominantly from a certain industry? Doing at least a certain amount in annual revenue? Companies who have been established for at least X years? Next, think about the leads who you’ve previously engaged with, but failed to convert. What are some commonalities that these guys have? Once you’ve done this exercise, you’ll be able to identify the attributes which indicate whether a lead is a good fit. Based on this, go ahead and weigh your attributes accordingly. Maybe their industry is a pretty good indicator of whether a lead will eventually convert, but it isn’t as telling as, say, the job title of the lead. Bearing this in mind, you may choose to assign a lead with an ideal job title +10, but a lead who’s in the ideal industry +5. Of course, in order for your lead scoring system to be comprehensive, you should also take other factors into consideration as well. Lead fit tells you how well a lead matches the brand’s usual buyer persona, which is basically what we talked about earlier. When deciding on lead fit, you should be evaluating your lead’s demographics, their company’s firmographics, as well as their Budget, Authority, Need and Time (BANT). Last but not least, there’s your lead’s Budget, Authority, Need, Time (BANT). Can they afford your product? Do they have the authority to make a purchase, or will they have to get a superior’s buy-in? How urgently do they need your product and service? Yes, that’s a lot of data that you’ll have to collect in order to score your lead. How do you get all this information? First, you can get your lead to sign up for your newsletter or download gated content. In your form, add a few fields to elicit the information you need from them. On top of that, you can also trawl their company’s website, and look at your lead’s LinkedIn page as well. After you’ve got the data, go ahead and score your leads based on whether they fit into the profile of your typical buyer. Lead fit aside, lead interest is also an important factor that can help you determine whether a lead is worth pursuing. In order to identify lead interest, you’ll have to track their online behavior, and assign numerical values to the actions they’re taking. As a general rule of thumb, the longer your leads spend on your website (and the more times they revisit), the better. There are certain caveats, though. Say a certain lead has visited your website thrice in the last week, but 90% of their time is spent on your Careers page. It’s fairly obvious that this person is just trying to get a job at your company - they’re not an actual lead. You’d assign them a negative score, and move on. If you’re trying to figure out how you can track the actions your leads take on your website, there are plenty of tools that will do just that. With Albacross, for example, you can easily track who’s visiting your website, and where they’re spending their time as well. The best part? Albacross is 100% free to use. First, you create a free account, which takes less than 30 seconds. (No credit cards required). Next, you install Albacross’s tracking script on your site either using HTML, Google Tag Manager, or a WordPress plugin. (If you don’t have much technical expertise, we recommend going with the last option). Once that’s done, just sit back and wait for Albacross to accumulate data about your visitors. …and you can use this information to score your leads, and decide who to get in touch with. Last but not least, you’ll also want to score your leads based on which stage they are in their Buyer’s Journey. How do you know what stage your leads are at? Like how you did in the previous step, look at which pages they’re browsing within your site. If they’re simply looking at your blog content, then they might still be in the information-gathering stage. You’ll want to assign them a score that’s positive, but not overwhelmingly so. If they’re looking at your pricing page, though, then this shows they’re thinking about making a purchase. Obviously, this warrants a higher score. Some leads might also sign up for product demos and webinars, or get in touch with you and request for custom pricing sheets. These guys are actively gathering more information about your company and product (instead of passively assessing the material that’s already available on your site). That’s a huge indicator that they’re at the last stage of their Buyer’s Journey, and that they’ll be ready to make a purchase soon. Bearing this in mind, make sure you score these behaviors generously. Awesome - you’re now an expert on scoring and filtering your leads. It’s time to move on to the next step: figuring out how to nurture leads. Most B2B marketers automatically equate lead nurturing to email campaigns. Simply relying on these drip campaigns isn’t sufficient. Now, don’t get me wrong - drip campaigns can be extraordinarily powerful, and I’m not telling you to ditch these altogether. What I’m saying is that you should use other strategies in conjunction with your email campaigns, so that you can increase the overall effectiveness of your lead nurturing. In this section, we’ll go through a few of these strategies, and teach you how to get started with them. Many marketers think that social media strategies are more suited to B2C companies than B2B ones… but we beg to differ. Look, we understand that B2B marketers find it tough to create compelling, interesting content for B2B companies. That said, this isn’t about what’s easy for B2B marketers. It’s about giving what your leads and customers want. And regardless of whether they’re dealing with a B2B or B2C brand, leads and consumers want to communicate with companies on social media. In fact, 63% of consumers expect brands to offer customer support over social media, and 31% of customers turn to social media to make pre-sale enquiries. With numbers like these, you can’t afford to not be on social. Ah, the classic expectations vs reality. 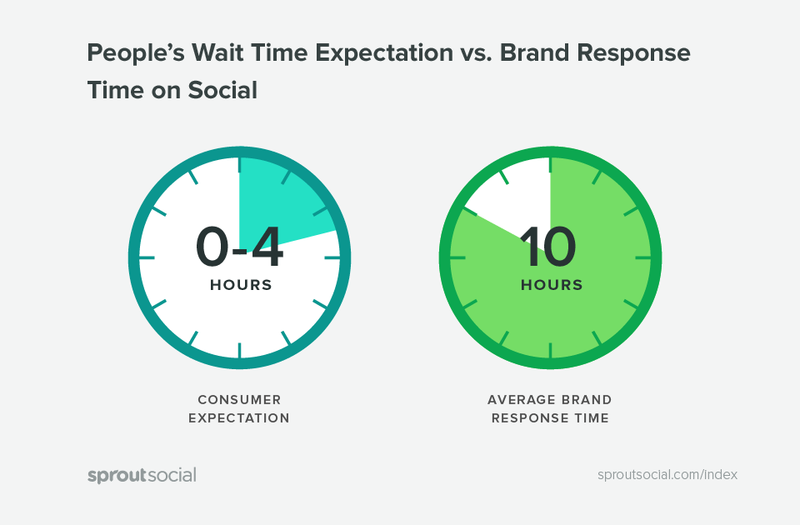 According to statistics, consumers who make an enquiry on social media expect a response within 0-4 hours. Buuuuut they only get it after 10 hours. Being slow to respond (or not responding at all) will hurt your business in a pretty significant way. More specifically, 30% of people will go to a competitor when companies don’t respond via social media. You do get rewarded for being responsive on social media. We’re talking up to a 40% increase in sales revenue, which is huge. So make sure you’re monitoring your social media channels, and that you’re getting notifications every time a lead leaves a comment, messages you, or Tweets at you. You now know the importance of responding to leads who are actively engaging with you on social media. On top of that, you should also be recruiting your other leads, and get them to join in the conversation as well. How do you do this? Simple. 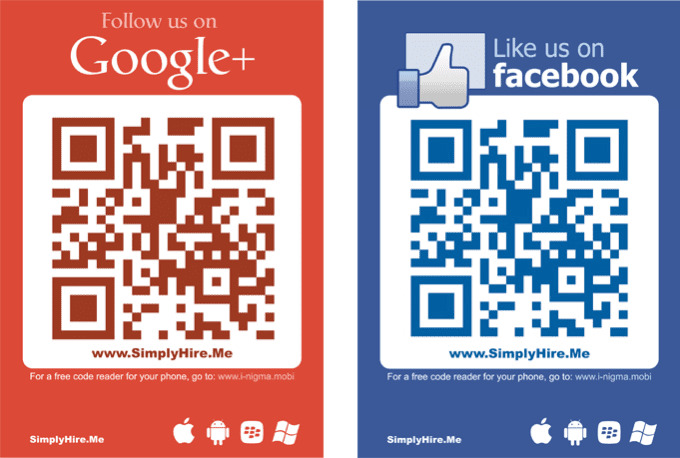 Display social QR codes on your website or marketing collateral, and encourage your leads to follow you on your social channels. There’s no hard and fast rule when it comes to where you should feature your QR codes, but if you ask us, your Thank You page is a great option. Say your lead has just downloaded an ebook, and they’re redirected to your Thank You page. Now, it’s a waste to literally just say “Thank you for your download!” on this page, and leave it at that. So why not include a secondary Call To Action (CTA), and ask your leads to follow you on social media? Aside from simply getting your leads to follow you, you can also use a QR code that allows them to connect with you via Facebook Messenger. If you have a chatbot handy, you can use this bot to nurture your lead, and feed them with more useful information about the product/service they’re interested in. For those who want to use chatbots to automate your lead nurturing, check out this article. If you’d rather do things the old-school way, that’s fine as well. Go ahead and talk to your leads and move them down the funnel yourself. The next trick that we’ve got up our sleeve is… retargeting ads. 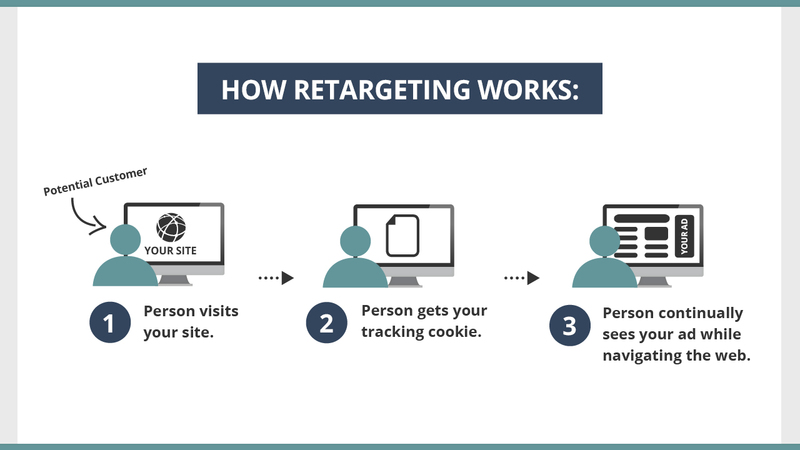 Now, retargeting ads are a tried-and-tested strategy, and they deliver great results. Among other things, website visitors who are retargeted with display ads are more likely to convert by 70%. And while these ads are more commonly used by eCommerce stores, there’s no reason why B2B marketers can’t use these to nurture their leads as well. With that, let’s discuss how you can retarget your leads using AdWords and Facebook Ads. For marketers already using AdWords, you’ll want to take a look at their Remarketing for Search Ads (RLSA) feature. First, create a remarketing list on AdWords, and add a remarketing tag to your site so that your visitors are added to this list. Next, add the remarketing list to your AdWords campaign, and think about how you want to target the folks on this list. One strategy is to increase your bid by, say, 25% for those on your remarketing lists. Because these people have visited your site before, you know they’re more likely to convert, so this justifies the extra spend. 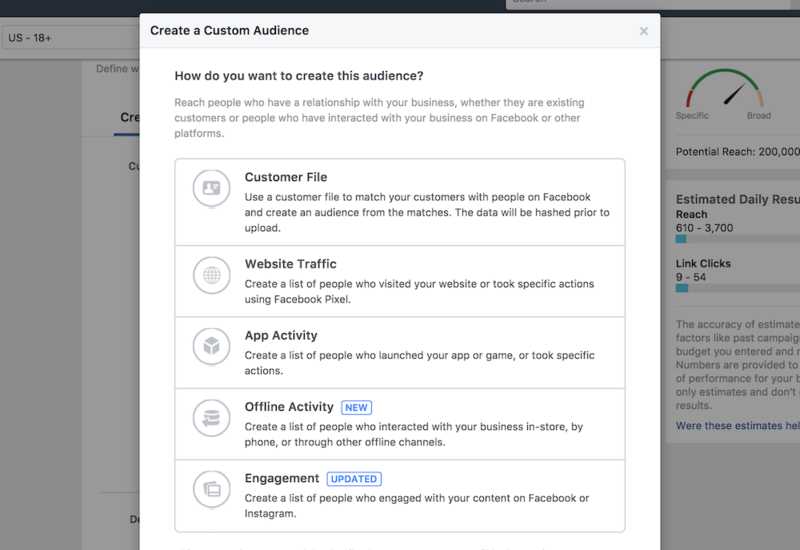 Alternatively, you can sift out the people on your remarketing list, and edit your ad copy to feature a different offer. Maybe they weren’t keen on your product demo, but you might be able to entice them with a free trial. Last but not least, some marketers like to bid on keywords that they don’t normally bid on in order to attract the attention of their leads. For example, after getting to know your product, your lead might double back and do a generic search to make sure they’re not missing out on any alternatives. Now, you might not typically allocate any budget to generic search terms (because these result in lower quality traffic), but again, you know these leads are likely to convert. So go ahead and make an exception. To learn more about AdWord’s RLSA feature, check out their help page. 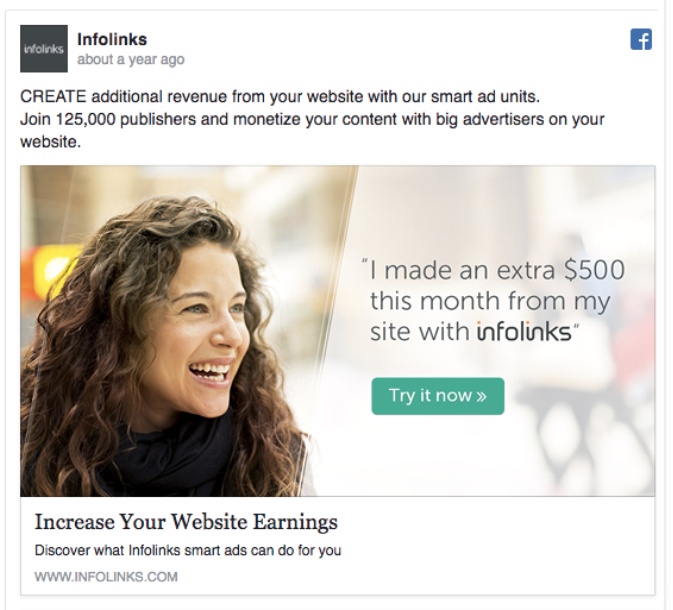 AdWords aside, you can also retarget your leads using Facebook ads. Like how you’d do with AdWords, you can retarget the people who have previously visited your website. Alternatively, if you have a list of email subscribers that you’d like to retarget, you can upload this list to do just that. Is it more effective to use Facebook or Google to retarget your leads? Well, there’s no clear-cut answer. The key difference between Facebook and Google is that Facebook ads are embedded within a lead’s news feed (as opposed to Google ads, which appear at the top of search listings). Your leads who are on Google might simply ignore the ads on top, and scroll down to the organic results. With Facebook, that won’t happen, since ads are scattered randomly within your lead’s newsfeed. …and even if you interrupt them with an ad, they’re not in the frame of mind to go to your website and make a purchase (or convert in any other way). We recommend that you test both platforms out, and see which works the best for your company. How do you optimize your retargeting ads, and increase their effectiveness? First, don’t just repeat your product benefits off your website. Remember: your lead has already seen those benefits, so you’d just be telling them something they already know. Instead, switch it up and make sure you’re conveying the value of your product to your lead. If most of your leads are CEOs, for example, you’ll want to emphasize the ROI that your product will bring, or the costs that it will save. Big-picture stuff. In order to reduce friction and convince your lead that they’re making the right choice, consider featuring customer testimonials on your retargeting ads as well. For best results, feature industry influencers and/or customers from reputable companies in these testimonials. Make sure to include their picture, name, and job title as well. Finally, use your retargeting ads to distinguish yourself from your competition. You know your leads have visited your website and checked out your product a few times - but they’ve probably done the same with several of your competitors. Bearing this in mind, your job isn’t just to talk about why your product is awesome. It’s to talk about why your product trumps your competitors’. At the end of the day, you want to provide your leads with a frame of reference that makes it easy for them to choose your company over their other options. Instead of blindly retargeting everyone who’s visited your site, save your ad budget, and only retarget those who have a high purchase intent. Here’s where your lead scoring comes in handy. Say you amass a thousand leads per month, and their scores range from -10 to 50. Simply sift out the folks who have higher lead scores (say 30 and above?) and retarget them selectively. Last but not least, you can also nurture leads by serving them dynamic website content. The interactions they’ve had with your company. One application of dynamic website content is personalized recommendations. Think Netflix, which suggests shows for you to watch based on your viewing history. And those product recommendations that you see on Amazon? Yup, those fall under the category of dynamic website content as well. Basically, you come up with different variants of your website to cater to different leads. If your lead matches certain criteria you set for them, Variant A might get displayed. If not, then Variant B is displayed. Say your company has amassed plenty of case studies and testimonials over the last few years. Now, you could simply display all these on your website and leave it to your lead to sort through them, but this isn’t productive. Use dynamic content to highlight and feature the most relevant case studies or testimonials based on your visitor’s industry. By doing this, you’ll be capitalizing on the social proof that these case studies and testimonials provide you. This helps you nurture your leads more effectively, and nudge them that bit closer to their purchase decision. Say you have a lead who signed up for your newsletter some time back. After going through your drip campaign, your lead is revisiting your website, and wants to learn more about your product. Now, do you think it makes sense for them to see that standard “Sign up for our newsletter” CTA on your homepage? The answer is a resounding nope. This CTA is now irrelevant, and your lead should be presented with a new CTA that brings them further down the funnel. Last but not least, there are also pop-ups which display dynamic content based on exit intent and other factors. Now, don’t worry - these are not your usual pop-ups that annoy the heck out of your customers, and cause them to churn. Instead, these are intelligent pop-ups that are timed perfectly to score a conversion. Let’s look at exit intent pop-ups, for instance. These are triggered either when a visitor starts moving their cursor towards the top right hand corner of the page (to close the browser), OR after X seconds of inactivity. With these pop-ups, you can reach out to your leads who are about to leave, and hit them with an irresistible offer. Maybe it’s an extended 3 month free trial (when your usual trial is only 10 days long). Maybe it’s a promo code for 10% off all pricing plans. Either way, these pop-ups give you an opportunity to nurture and close your leads (instead of letting them just bounce off your site). Exit pop-ups aside, you can also utilize other dynamic pop-ups to reach out to your customers. If Lead A arrives on your website from a newsletter, and Lead B arrives on your website from a social media post, for example, it makes sense to serve them different pop-ups. The same goes for Lead A, who has been to your website 10 times prior to this visit, and Lead B, who’s only visited your website once. Different pop-ups are more effective! Alright, that’s all we have for you on the topic of dynamic website content. If you want to start using dynamic content on your site, check out Geotargetly. To serve your visitors dynamic pop-ups, check out this list of pop-up scripts and plugins. We hope you enjoyed our guide on how to nurture sales leads, and that you’re leaving with plenty of helpful takeaways. Now, it’s time to get down to business, and start implementing these strategies. Remember: A/B testing is a marketer’s best friend. As long as you constantly measure your results and refine your strategies, you’ll be on the right track.